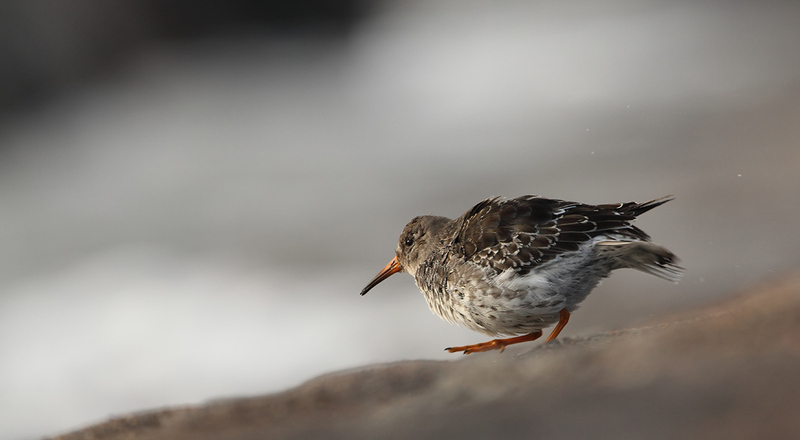 Winter time is purple sandpiper time in Denmark, and what a great subject they are to photograph! They aren’t as skittish as most other birds, but they are very fast and agile, and since they also come quite close the focus and general composition is a real challenge. I went across our own little island of Fyn/Funen to photograph what turned out to be a nice flock of six of these attractive little Arctic visitors. My aim was to get some “action” into the shots, with the birds interacting with the spray from the waves. The light was a challenge – the pier runs SW>NE, the wind was SE, and the light as well – so no matter how I snuck around, the best I could do with regards to light was perpendicular to the shooting direction; and that even meant a real risk of getting drenched by the breakers! As it turned out I only got mildly wet, and the camera fared even better, but that was probably down to luck. I had been meaning to use the 300mm f4 lens, but as it turned out they weren’t THAT cooperative so I was happy to have brought the big lens as well. The AF in my EOS 5D mkii had big problems with the spray from the breakers, but that is hardly surprising. I hope you enjoy the gallery; remember to click it up in size!